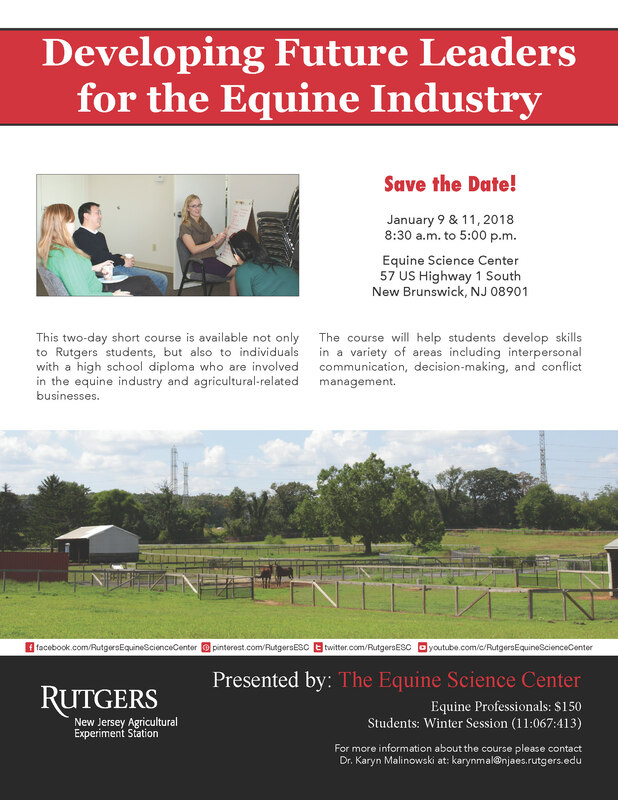 The Rutgers Equine Science Center is happy to announce the 2018 “Developing Future Leaders for the Equine Industry” Winter Course. This short course is designed for individuals involved in the equine industry and agricultural-related business. Participants will develop skills in a variety of areas including interpersonal communications, decision- making, and conflict management. The skills which students acquire can be used to improve and enhance involvement not only in equine industry but also in community and governmental organizations. The course will be taught by Dr. Karyn Malinowski, director of the Equine Science Center. Students will be charged winter course fees and can register by going to http://wintersession.rutgers.edu and signing up for the course 11:067:413. Those not taking the course for credit will be charged $150, and may contact Dr. Karyn Malinowski at: karynmal@njaes.rutgers.edu.